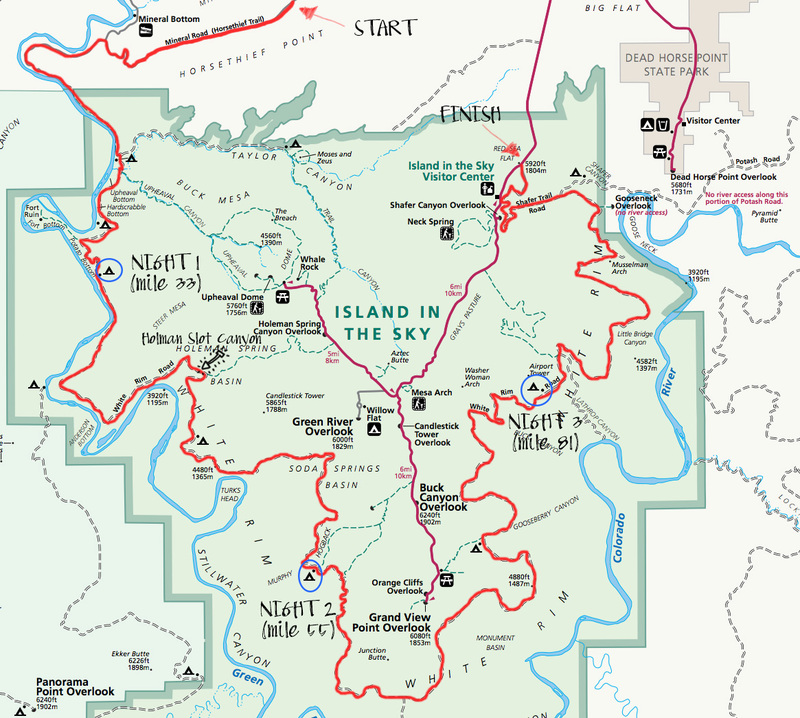 The White Rim Trail, located in the Island-In-The-Sky District of Canyonlands National Park, is a true back country escape into desert wilderness. It features breathtaking views, massive red cliffs, sweeping arches, ancient Indian granaries and endless exploring opportunities. 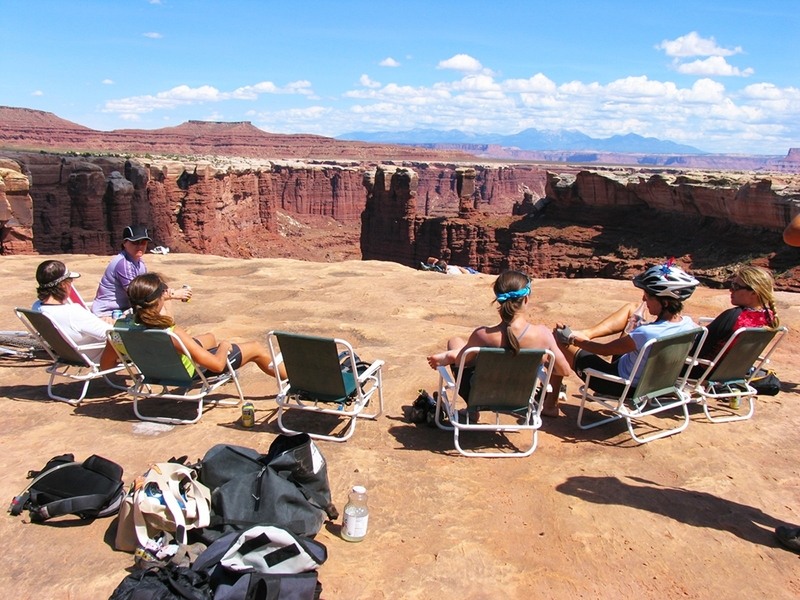 There are many ways to experience The White Rim. The easiest way is to view it from any of the pavement-accessible mesa-top overlooks in Island-In-The-Sky, but to really experience The White Rim you need get up close and personal. To do that on your own you’ll need to get either a day use or overnight permit from the park service. However, The White Rim is extremely popular, so permits tend to sell out quickly. Another, much easier, way to experience The White Rim is via a guided mountain bike tour and there are several kinds to choose from. Most people want to spend enough time on their tour so that they can drink in the amazing views and relish the other worldly landscape, so typically, White Rim tours are 3 or 4 days in length. 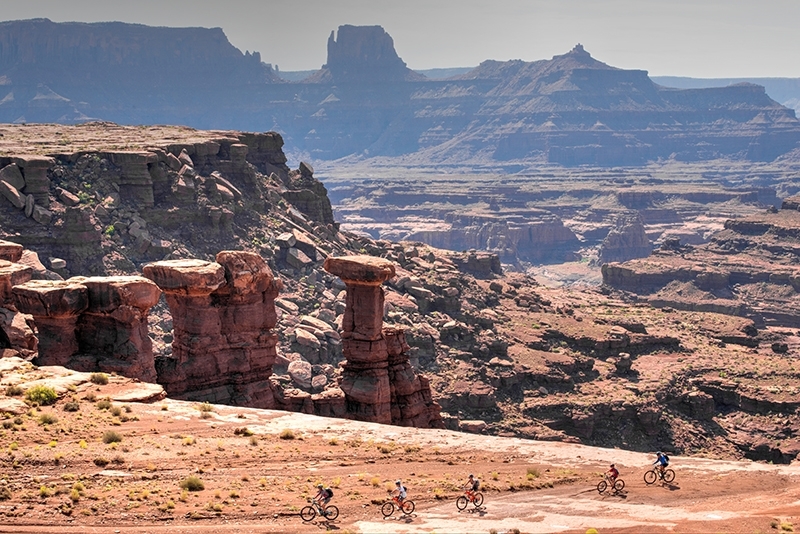 Riders roll along the “White Rim” layer of sandstone, with dramatic canyons below and majestic red rock cliffs above. The trail leads to arches, towers and other fantastic rock formations. 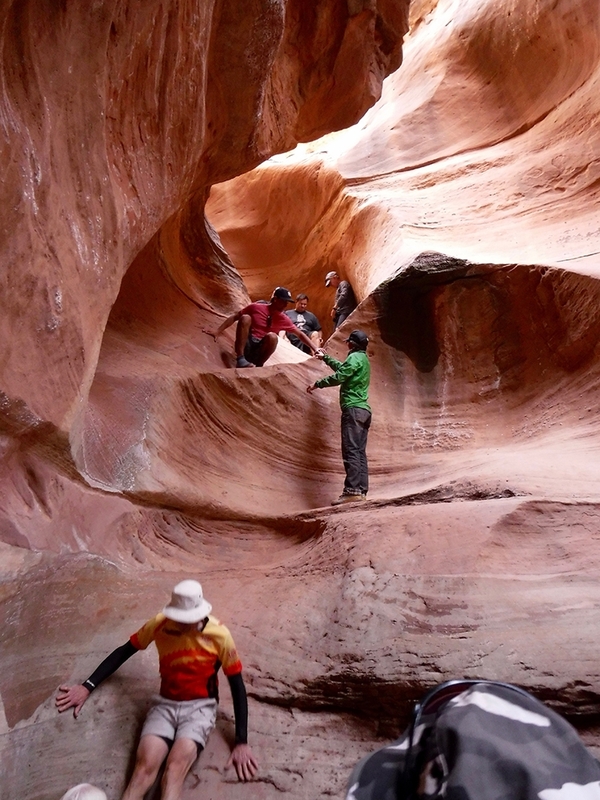 Guides lead guests on bike and on foot to explore an Indian dwelling of ancient times and perhaps trek down into a slot canyon disappearing into the desert sandstone. The White Rim is the trip of a lifetime. Since the route is basically a “loop,” (minus a section of dirt and paved road that connects the starting and ending points) tours operate in both directions — clockwise and counter-clockwise — the direction of your tour will depend on the order of the campsite reservations handed out by the park service. Starting in either direction, tours begin with an exhilarating downhill run, dropping 800 feet or more down a graded switchback dirt road. Once down off the mesa, the road becomes a very rough 4-wheel drive route that for much of its length traverses a wide bench above the Colorado and Green rivers. 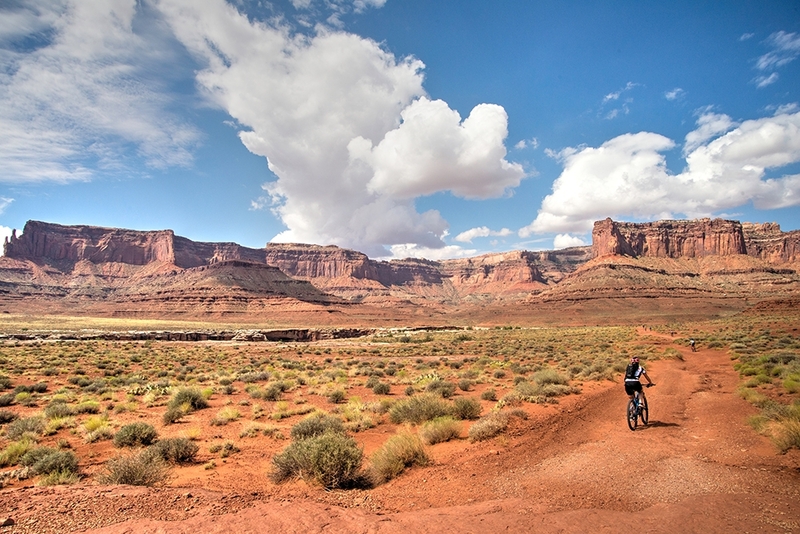 From afar, The White Rim Trail can appear to be fairly flat, but the ride actually includes numerous short climbs and descents as the trail weaves in and out of canyons. It also includes several major climbs up and over ridges that interrupt the bench. Plus, on the final day, riders must regain all the elevation they lost during the first day’s exhilarating descent by climbing back up to the top of the mesa. 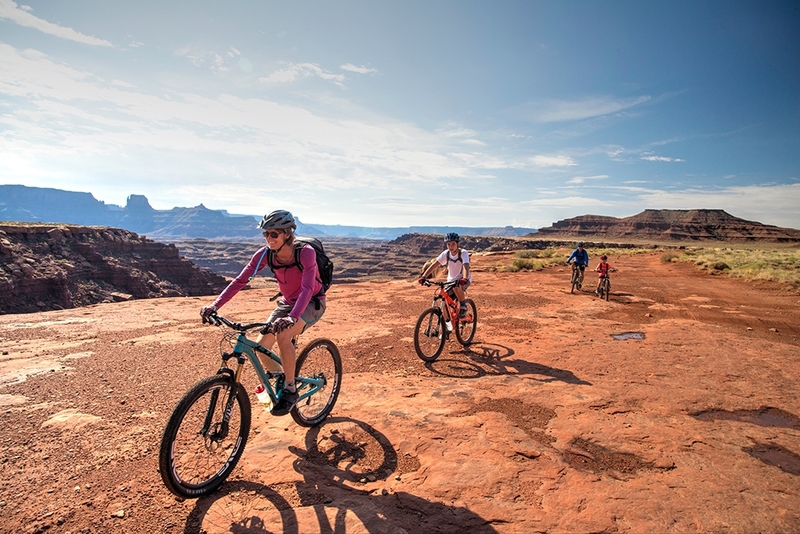 You don’t need to have much off-road mountain biking experience to tackle The White Rim Trail but you do need enough physical stamina to handle the climbs, the roughness of the road, and the miles covered each day, which differs depending on the number of days. On the four-day tour, groups typically ride approximately 17 – 27 miles each day, covering close to 90 miles by the end of the tour. The three-day itinerary completes the same total mileage but in fewer days, riding approximately 30 miles each day.